Creator: Harriett Pettifore Brims 1864-1939. Description: Image 236 Harriett Brims Collection. Harriett Brims was born Harriet Elliot in 1864, at either Yandilla or Toowoomba, Queensland. Her parents were Walter Elliott, and her mother was Ann Jane Elliot (nee Faulks). They were early pioneers of the district and owned a station in the Barcoo district. Harriet attended the Blackall School. 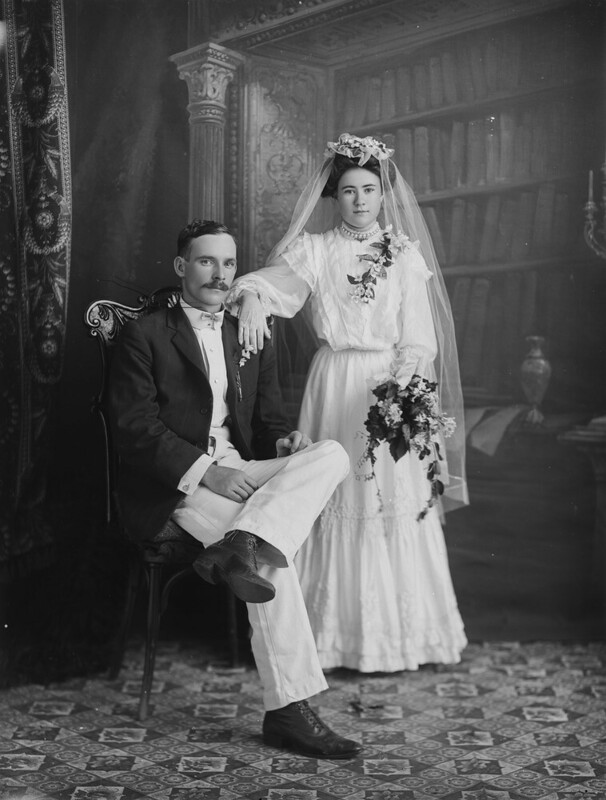 In November 1881 Harriet married Donald Gray Brims in Blackall, Queensland. Brims was an engineer from Caithness, Scotland, who worked as a contractor and coach builder. They had five children over a period of eight years (1882-1890). Initially the couple moved to Townsville and then travelled north to Cardwell, where they were said to be ‘the first white settlers in the Herbert River district’ (The Telegraph 1939). By 1894 they moved to Ingham and it is there that Harriett Brims began her photographic career. It is unclear what inspired her to take up photography, nor is it known where she trained. Harriett Brims set up her own photographic studio, the Britannia Studio, which operated for six years and appeared in the listings of the Pugh’s Trade Directory in 1902. By c.1903 she had moved her business to Mareeba, where she operated a studio for ten years. She also worked at ‘visiting studios’ in other Queensland towns, including Chillagoe during 1904-1905, Irvinebank as well as Watsonville, both located near Herberton in 1907.She worked as a professional photographer for 16 years, becoming quite skilled and well known for her work. Brims was highly regarded for the time and care she put into producing her photographs: ‘many interesting accounts of the labour involved [in] producing photographic plates, [and] devising schemes of processing, etc [sic] give ample evidence of her skill’ (The Telegraph 1938). Her husband, who was also a keen operator, made the dry-plate cameras she used out of maple wood, the carrying cases out of cow hide and the camera shutters out of sheet brass that he salvaged from discarded opium tins. Brims documented the reality of everyday life in these Queensland towns, capturing early forms of transportation (airplanes and bullock teams), the copper smelters of Chillagoe, local events such as the aftermath of a cyclone, the activities of Melanesian labourers (who both worked and lived in the North Queensland cane fields), social gatherings, local landmarks, as well as some portraiture….. By 1914 the family moved to Brisbane, at which stage she gave up her work as a professional photographer, instead focusing her time on photographing her family, friends and her local neighbourhood. Harriett Brims died in Brisbane on 25 October 1939, aged 75.’ –[Information taken from The Australian Women’s Register, (Anne Maxwell (with Morfia Grondas and Lucy Van) retrieved on 22 March 2018 from www.womenaustralia.info/biogs/AWE6006b.htm].